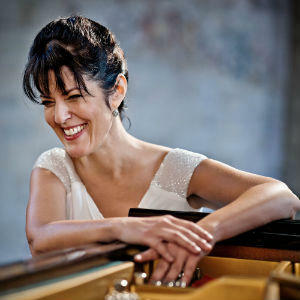 Sandra Shapiro is a classical pianist and a member of the faculty at the Cleveland Institute of Music. She is also a guest faculty member at Interlochen Arts Academy this semester. Shapiro visited IPR's Studio A to perform two mazurkas by Anatoly Liadov. She explained how these pieces are connected to her Musical Roots project, which uses music to trace her father's journey as an immigrant from the Soviet Union to Europe to Israel to the United States. Sandra Shapiro will perform a recital with excerpts of her Musical Roots project Saturday January 26 at Interlochen Center for the Arts. Click here for more information about the performance. Brock Morman engineered this recording. An edited transcript of IPR's interview with Sandra Shapiro appears below. IPR: Tell us what brings you here to Interlochen in this semester. SANDRA SHAPIRO: I am taking over for T.J.’s [Lymenstull] studio for his sabbatical. I'm very excited to be here and to work with some new colleagues … and a brilliant bunch of young musicians. It's sadly only for this semester, but hopefully the relationship will continue after that. IPR: Is this your first time to Interlochen? SS: I have been here over the course of four summers—not as faculty but as a mother visiting her child. My youngest is a trombonist and spent four amazing summers here. I came quite often to hear performances. My youngest is a trombonist and spent four amazing summers here at Interlochen. IPR: The weather is a little different now [in January] than it was [in the summers]. Because you spend most of your time in Cleveland teaching at the Cleveland Institute of Music, which place is currently having the worst winter: northern Michigan or Cleveland? SS: Actually I believe you have won. We've had awful, awful winters, though, in the past. Seriously, weeks of subzero—and that's not wind chill subzero, it's actual subzero—and compounded then with the wind chill. And then we also have the never ceasing lake effect. IPR: We are familiar with that here in northern Michigan. SS: I must say that, at least on this [Interlochen] campus, you're much more efficient dealing with the snow. I'm amazed, and people are really on top of things. IPR: We are very grateful for our folks who take care of that. I wanted to talk to you about your Musical Roots project, which started as you were researching your father's life. SS: My father passed away when I was quite young, and I never really had the chance to know him as an adult. As time went on, I had many questions, especially after I had my own children. I really regretted that he never had the chance to meet his grandchildren. I really started wondering more and more about his life and what he must have gone through, and what the path was from—at the time—Soviet Russia all the way to Israel, where he met my mother, and ultimately to the United States. I had many questions, especially after I had my own children. I really regretted that he never had the chance to meet his grandchildren. I started looking into it back in 2004. My mother asked me if I was interested in having this letter that had come to my father years ago, apparently from Moscow. [The letter] was addressed to him, and I said sure. I opened the letter. Beautiful handwriting. In Russian! I don't speak Russian, I don't write Russian or read Russian. I'm learning right now…. I had it translated and basically it was written to him: “My uncle, why have you been silent? Why do you not write to me any more? What's happened? Are you angry with me? What have I done? Please tell me.” It turns out it was my cousin, and I have only two cousins. My father had one younger sister who passed away back in 1972, and apparently he had had continued corresponding with her daughter. Nobody told her that he had died. I immediately wrote back and in English. I wrote to the address that was on the letter and was waiting, waiting, waiting. And nothing. About a year later, I received a letter from what used to be East Germany. My letter that had been addressed to Moscow found its way to my cousin, who had left Russia after the Berlin Wall fell … and they were now in this portion of East Germany. Miraculously, that letter got to her, and it was amazing. We started corresponding via translators, and then I was able to get more answers. But this was 2004, and I came to a complete stop because she didn't have everything I needed. She knew nothing about how the actual journey had gone. And I put things aside—I had two young children and life happens. But then with the last set of elections [in 2016], everything that was going on around the immigration topic, the debates, what would appear to be growing xenophobia, all of these things started were disturbing to me. I am the daughter and sister of immigrants. Even my brother was not born here [in the United States], and it was really disturbing to me. I started thinking a lot about it. thinking that, you know, I'm so proud of my roots. [My father is] Russian, my mother's Israeli, and I wanted to do something to respond to this wave of frightening events. I'm so proud of my roots. My father is Russian, my mother's Israeli, and I wanted to do something to respond to this wave of frightening events. I thought, well I'm a musician, [so] I need to do through my music. I had been so interested in my roots [and] proud of my roots, and I felt so strongly about each part of that in me. I started thinking about how much that influenced me as a person, as a musician, and my children as well…. I decided to think about the fact that we're all immigrants. My story is not only my story: it's everybody's story in some way or another. My story is not only my story: it's everybody's story in some way or another. I then got back to work and trying to trace my father's steps. Fascinating. Unbelievable. And I’m working right now on my mother's side. The Sephardic side I've traced back now to 1510. I knew we went back a long way. I knew my family on that side was one of the oldest ones in Israel. But I had no idea the extent of that. That's the second part of the project [her mother’s heritage]. The third part is about my musical influences—meaning my teachers, most of whom were European … or educated either in Europe or by Europeans. The fourth and final part of the project is about composers that were either exiled or chose self-imposed exile, or that wrote about their experiences and their influences from other cultures other countries. IPR: In this Musical Roots project of yours, how are translating your father's journey from the Soviet Union to Israel to the United States? How do you translate that into pieces of music? SS: As I was able to uncover certain aspects of this journey of his, I started thinking about works that would reflect the highlights of particular things, things I knew nothing about. So for example, [the piece by Anatoly] Liadov: I found out that my father had escaped from the Russian army. He was drafted as a very young man. He was in medical school in Odessa at the time. The Soviets evacuated what they considered essential personnel, meaning the young medics. In this case my father to the Ural Mountains, where they gave them crash courses in field medicine and sent them out into the army. He was part of this army that liberated the Warsaw ghetto. Only three months ago, I was sent photographs of medals that he had apparently been awarded [and] that I knew nothing about. So there was the liberation of the Warsaw Ghetto. There were a few others. And then the liberation of Berlin. He was stationed in Berlin as a medic there in the army base and found out that he was going to be sent back to a gulag because, at the time, Stalin was unhappy with Jewish doctors. There was something called “the doctors’ plot.” That was [Stalin’s] last major, how shall I say, terror tactic before he died. My father's commanding officer loved my father, so he helped him escape. My father escaped to Augsburg, which was an American army base, and from there they sent him to Föhrenwald DP camp—displaced persons camp—which was the largest DP camp at the time specifically for Eastern European Jews. He served there as a doctor. I found out—by sheer chance—from a woman who happened to be a child in the camp, and he was their family doctor. And I found this out hours before I was to walk out on stage for a Carnegie Hall recital two years ago. She saw the advertisements and reached out to me via my website…. I had to put it out of my mind. I had to focus on the concert. Long story short, it turns out that his closest friends [in the DP camp] were Polish, and this was a friendship that remained until he died. They kept up their correspondence. They eventually settled in Chicago. We ended up in Milwaukee, and they kept very close contact. They were Polish, as I said, and I picked the Liadov [piece] because Liadov is a Russian composer, thus representing my father [and] his roots. But, Liadov chose to write a mazurka, which is a Polish dance. Liadov is a Russian composer, representing my father and his roots, and the mazurka is a Polish dance. My father was a very accomplished accordion player, but I never heard him. He was [also] an incredible pianist and could play anything by ear. Apparently in the DP camp at night, he would pull out the accordion and play for everyone. They would sing, they would dance, and what better thing to choose than these pieces [mazurkas by Liadov] and [pay] tribute to his closest friends? Liadov not a composer known in this country, sadly, because actually he wrote some really lovely works. These little gems—I call them bonbons—are very well known in Russia [and] in Eastern Europe. They’re very standard for pianists to play. I'm so thrilled to be able to introduce them to American audiences. IPR: Sandra Shapiro, you're just here for one semester filling in for a sabbatical leave. What's it like working with students just for one semester. What are some of your goals for them? SS: It is very challenging, especially for one semester. The timing is challenging as well because T.J. [Lymenstull] has entrusted me with getting his seniors ready for their college auditions, their jury exams at the end of the year, [and their] senior recitals. So it's a little daunting walking into that. I did specify during the interview procedure that, should I be the one chosen [for the position], is that I would like to be able to come up once or twice prior to the semester. [I wanted] to be able to hear each student briefly, to have a chance to sit [and] to discuss them with T.J. and understand his educational plan for each one, and to make sure that they were comfortable knowing who was coming in and could ask me questions prior to coming in. An important part of it was not to just simply come in as an unknown from both sides and disrupt their lives. It’s a very sensitive thing right now. You know they're at a critical point in their lives.